So, readers of The Billfold (and Nerdfighters! ), consider this a special treat. A conversation with Alan Lastufka about his work on DFTBA Records, from co-founding the record label in 2008 to selling his stake in 2014. — What was the big idea or brainstorm that prompted you and Hank to start DFTBA Records? So before the label even launched I had already pre-signed Dave Days and Chameleon Circuit and had reached out to a few other users who were quickly building their audiences. I had run a zine distro before, so I knew a little about mail order fulfillment and online order processing. And I had recorded a few of my friends’ punk bands in high school/college so I knew a little about music production. At the same time, my friend Hank Green had gone on tour with his brother John Green to promote John’s latest book Paper Towns. On these tour stops Hank performed a few of his original comedy songs each night. He had made some CD-Rs to sell at the events and saw how eager fans were to own his music. So some time after tour, during one of our frequent AIM chats, I mentioned my plans for Blue Tape Media to Hank, told him about the groundwork I had laid already, and asked his thoughts on the project. He got very excited about the idea and saw the potential (probably more so than even I did). He offered to fund the entire project, help with all the legal stuff of actually becoming a company, and to help with promotion in exchange for 50% equity, the right to release his albums through the label, and a name change to DFTBA Records. I saw the value Hank brought to the table and quickly accepted his offer. After that things moved quickly. We got all the paperwork in order and became an official LLC. Hank started recording what would become his debut album, and the label’s first release, So Jokes, and I started setting up the manufacturing and distribution side. We announced the label in November of 2008, Hank on the vlogbrothers channel and me on my collab channel fiveawesomeguys. 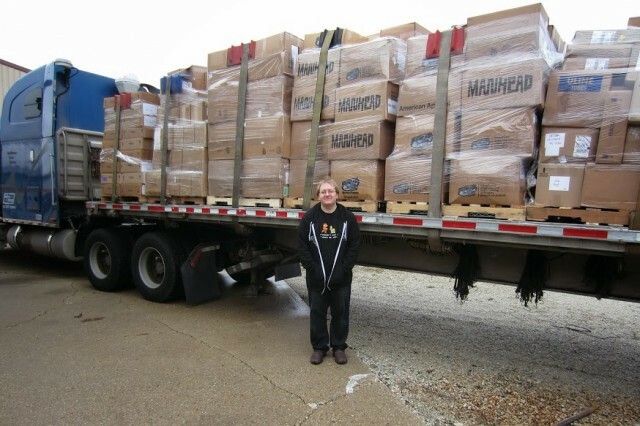 A month later we started shipping out orders for the first time. — What did you think DFTBA Records might become, when you started it? Like, within a year you were Mashable’s Best Indie Label of the Year. Did you plan to become a leader in that space, or did it happen completely on its own momentum? Of course you dream big when you start any new project. But as far as realistic plans, I was working full-time at a non-profit during DFTBA’s launch and first two years of operation. DFTBA filled my evenings and weekends, but most days didn’t require more than an hour or two of attention in the beginning. Back in 2009 we had less than 20 products total (we now have over 300). My hope was that DFTBA would be sustainable enough to help a few of our friends supplement their income from YouTube, and profitable enough to provide maybe $500/month in extra income for me so I could start paying down my student loans or just have a little breathing room in my budget. The entire project took up the space of just a few boxes of merch at the foot of my bed when we started. It was the humblest of humble beginnings. For that first release we were printing off pre-orders one at a time from PayPal. My friend Monica drove down from Michigan to help pack CDs with me all weekend, and we live streamed most of that first packing party on blogTV. It was exciting. It was a lot of work. And it was amateur hour for sure. After printing each individual orders from PayPal, we had to weigh and add postage to each package individually. It was very inefficient. However, within the first year of operating we had mastered bulk order processing and shipping, we had graduated from a WordPress plugin cart to actual cart software and shipping management software, and, more importantly, we had paid out hundreds of thousands of dollars in royalties to our artists. Despite some of our early inefficiencies, the idea, and the intentions behind it, were solid and something the community could really get behind. And they did. Each new artist we worked with brought their own audience to DFTBA. And we found that fans of one artist quickly became fans of our other artists. As that community grew we did some limited community building events, like live streams, a podcast radio show featuring our artists, and a few street team events with iPods as prizes. But no one becomes a lifelong advocate for your project because they won an iPod. Instead,we had all of these great supporters because they believed in what we were doing. And that support is manifested in things like the Mashable award, and YouTube allowing DFTBA to take over the front page for a day to feature a number of our artists’ music videos (back when front page features were a thing), and yes, becoming a leader in that space. It all happened organically, but quickly. And it all happened because of the rallying community. That community spilled over into the employees we eventually hired as well. Kristen Franklin, an early fan of the Vlogbrothers, someone who actually attended one of the shows from the Paper Towns tour I mentioned earlier, and my eventual girlfriend, became DFTBA’s first on-site employee. She took over order fulfillment duties in year three, and she was promoted to her current position as Project Manager last year. We also hired nerdfighter Matthew Gaydos to help run the shipping department last year, as well as host our weekly update show, The Warehouse, where new products and events are announced. Our Operations Manager, Dave Loos, was a friend of Hank’s and also works as a writer for SciShow occasionally. We also brought John Green on as a partner in 2012. — Since this is The Billfold, we’re all interested in the personal finance portion of the story. Did you invest your own money into DFTBA Records when it started? At what point did you start drawing a salary? Can you talk about your time-to-income ratio during the early years of the project? I invested the sweat equity, and Hank invested the actual money equity. Hank loaned DFTBA about $30,000 to get us started. That initial capital investment was the only debt DFTBA as a company has ever held, and we were able to pay it back within about 12 months. Neither Hank nor I took a defined salary at the beginning. Instead, I set up a system in which we got a certain cut of each and every sale (at a 2:1 ratio in my favor, as I was actually laboring each day). This system guaranteed the company would never be on the hook for more than it brought in. Which meant, at the beginning, that most of our paychecks were small. But it also meant that as the company grew rapidly, those paychecks increased rapidly. After we hit our first $1,000,000 in sales, the whole “cut of each and every sale” got a little excessive, and we instead decided the company’s profit was steady and predictable enough at that point to set salaries for ourselves. In those early years my time-to-income ratio was probably minimum wage or less. I literally did everything. Order processing, product design, web development, customer support, payroll processing, etc, etc. But you know what? I hardly noticed. I loved DFTBA as a concept and as a reality and put in however many hours it required. As the project developed, that time-to-income ratio swung hugely in the other direction, so you will never hear me complain about those early years. It was a lot of work, yes, but I would frequently receive little and not-so-little acknowledgements that we were on the right track. An artist would peak on the iTunes charts. Or YouTube (the company) would blog about us. A reporter would get in touch to do a story. Or we’d receive an email from a new YouTuber looking to work with us. Each and every one of those moments helped to supplement those early lower paychecks. — Was there any point where you considered bailing because the company was costing more (in terms of personal out-of-pocket funding, opportunity cost, literal space in your home) than you were willing to invest? Never. While the early days certainly weren’t as prosperous as the last few years, we were making money from sale #1. The royalty structure I set up ensured that. And while Hank loaned DFTBA the money to get started, the project was self-sustaining after just a few months and we started paying back that debt within six months. I grew up money stupid. My parents never taught me anything about personal finance. My mom at one point was six figures in consumer debt. So, I guess she taught me how to spend, but not much else when it came to money. So my personal financial life was a mess when DFTBA launched. I was renting a single room in a friend’s house, had to occasionally hit mom up for cash to make it through to payday, and slept on a futon because it was cheaper than a bed and could be used as a couch during the day. I’m sure if I had had a bit more money knowledge I probably could have done without the loans from the Bank of Mom, and might have even been able to afford a bed. But when you work low-paying jobs, and don’t think to budget, money just sort of disappears. When DFTBA grew from my bedroom to a spare room, to the garage, and finally to our first legit office/warehouse space, I noticed my bank account wasn’t hovering at zero by the end of each month anymore. I had been deferring student loans up to that point, and just not paying some of them, until I got a letter from Sallie Mae about garnishing wages. That letter decided for me: it was time to learn how to manage my money. I started with personal finance blogs. Those immediately lead to Dave Ramsey’s book, Total Money Makeover, which I read cover to cover twice. I highly recommend it as a good starting point. There are a number of religious references in the book, but if that’s not your thing, they are easy to ignore and don’t affect the money lessons. I also read The Automatic Millionaire, Your Money or Your Life, and a few Suze Orman books (along with watching her CNBC show). — When did you start thinking about selling your stake in DFTBA Records? At various points over the last two years John and I had discussed buyouts and future investors and “would we sell?” These were all hypotheticals at the time, but it’s good to know where your business partner’s head is at. But this past Christmas we had the first of what I would consider non-hypothetical conversations. I was talking to John about my personal finance goals and my business goals, and I realized I was at a point where a sale would make sense. — How long did it take for you to go “I think I might want to sell my stake in DFTBA Records” to “I am going to sell my stake in DFTBA Records?” Days? Months? Years? It’s difficult to say because it had been such a long conversation. Hypothetical or not, you start considering the various scenarios. So when the Christmas conversation felt less in-some-distant-future and more this-might-actually-happen, I think I started making up my mind at that point. After I felt like my mind was made up, I communicated that to John and Hank and was presented with a Letter of Intent on March 22nd (a Letter of Intent is basically a formal “I would like to buy your shares so let us start discussing that” note). At that point I was 98% sure I was going to sell. I had run various investment and income scenarios, various budgets in worst case and best case and most probable case. I was confident in the decision to sell because I already had a plan on paper by the time that opportunity presented itself. It took about three months for due diligence, contract negotiations, and the rest to happen. We announced the sale on June 18th. — What prompted the decision to sell? — Why did you decide to sell everything? I imagine you could have stayed on as a Partner if you wanted to. You could have been the Bert Cooper of DFTBA! I’m an all-or-nothing kind of guy. I probably could have held on to 10% or so and continued to collect profit distributions every year. But it wouldn’t be a controlling percent, and the company would be at the whim of the majority owners. I think that would have been frustrating, both for me and for the other owners. If I would envision a project going one way, and they wanted to take it in another, I’d feel like a road block or they’d feel like they’re going against me. That’s not a positive place to be. I am incredibly proud of what we built up to this point, and I am confident the team of employees that Hank and I put together will continue to grow DFTBA. Which direction that growth takes though is no longer mapped out by me, and I’m okay with that. It’s someone else’s turn at the wheel. — Advice to other entrepreneurs! The one thing we did when we started DFTBA that I think most start-ups could benefit from: start small. I did all the packing for the first two years until we needed to bring on a second employee. We operated out of my bedroom, and then a second spare room until we were bursting at the seams, and then we moved out to the garage. We were over two years into the project before we got our first warehouse space. For the first year and half we offered no other products than CDs. Then we expanded into the t-shirt market with… one shirt design. Of course now we have offered hundreds of shirts in various cuts and colors but it took us over four years to get there. Had we started there, we would have taken on unnecessary debt. We would have overwhelmed our still very early and small customer base. Inventory would have been much more complicated. It would have been a mess. And we would have sat around among piles of unsold stock. Expand only when you’ve outgrown your current space. Having big dreams is fantastic, but you can’t go from 0 to 100 overnight. You should get there gradually, building a solid foundation for your company as you grow. — And of course the ultimate question: what’s next? But there’s no Next Big Thing, yet. No new start-up or plan to take over in any other field. For now I’m just enjoying a little bit of down time and working on projects that fill my heart, not my wallet. Let’s see how long I can pull that off.